Another reason to study folk epistemology is that biases associated with it may be exploited for less than noble purposes. Consider, for example, what I call epistemic focal bias. Simplified, it may occur when an error-possibility is made salient and we automatically process it as if it is relevant to knowledge – even when it is not. This may result in false negatives: Cases where the subject in fact knows that p but is mistakenly regarded as a non-knower. Consequently, epistemic focal bias may be exploited to manufacture doubt or illusions of ignorance. For example, I may stall some action that rests on a known fact by raising an error-possibility. If I do so in a clever way, you will be less inclined to regard yourself and others as knowing the fact in question. But, if so, you are less likely to act on it. For instance, climate change deniers excel in making salient various error-possibilities to the proposition that global warming is caused by CO2 emissions. Even though many of these error-possibilities are epistemically irrelevant or even rebutted, raising them in the right context may effectively motivate the claim that we do not know that global warming is caused by CO2 emissions. Of course, the biases of folk epistemology are only part of the broader account of why climate denialism remains prevalent. Yet it may be an important and poorly understood part of the full story. 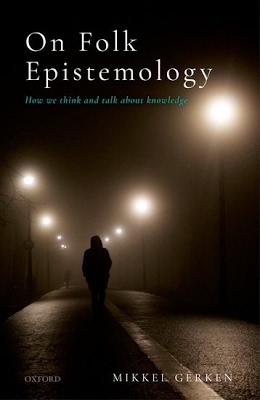 Fortunately, the study of folk epistemology may help to improve our understanding of it. More generally, On Folk Epistemology provides some cautious optimism about the idea that epistemologists may play an important part in an inter-disciplinary effort to resolve epistemic injustices that arise from biases inherent in our folk epistemological presuppositions and practices. Identifying and diagnosing folk epistemological biases is intrinsically valuable. But it also marks an important area for applied epistemology as well as a novel interdisciplinary research field. won't my biases keep me from absorbing any corrections to my biases?